Moraxella catarrhalis (M. catarrhalis) is an important cause of community-acquired upper respiratory tract infections accounting for 10%–20% of acute otitis media and acute bacterial sinusitis especially in children. In addition to this, according to the recent data, M. catarrhaliscauses approximately 10% of exacerbations in chronic obstructive pulmonary disease (COPD) patients, making it the second most common bacterial cause of exacerbations after H. influenzae. In immunocompromised hosts, the bacterium can extend its potential to cause endocarditis, bacteremia, neonatal meningitis and septic arthritis. Although most of the cases of M. catarrhalisinfections recover without any complications, the prognosis is variable and tends to be worse for immunocompromised and COPD patients. Due to the pressures of antimicrobial treatment, there is growing concern over the spread of resistant pathogens throughout the world due to the emergence and dissemination of antimicrobial resistance mechanisms. For M. catarrhalis, these concerns have focused primarily on the production and spread of various types of beta lactamases. Globally an increase in beta-lactamase producing M.catarrhalis has been reported. This fact is alarming as amoxicillin is commonly prescribed for the treatment of these respiratory infections and could result in treatment failure if used in beta-lactamase producing strains. However regarding test for β-lactamase production, British Society for Antimicrobial Chemotherapy (BSAC) states that β-Lactamase positive isolates of Moraxella catarrhalis are often slow to become positive so tests must be examined after the longest recommended time before being interpreted as negative. 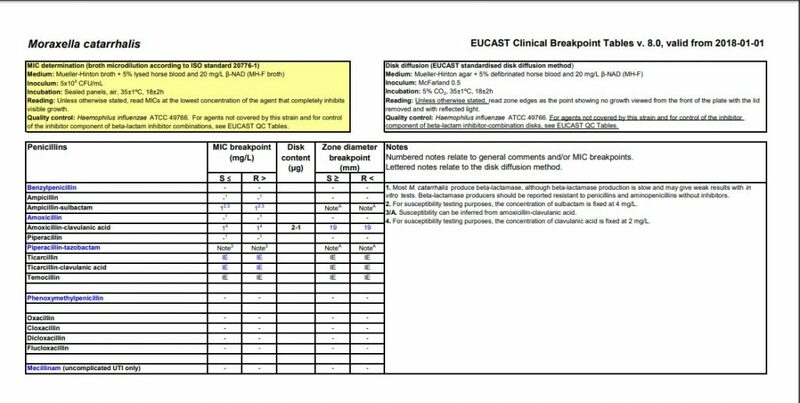 The susceptibility breakpoints for M. catarrhalis are not defined in the 2010 Clinical and Laboratory Standards Institute (CLSI) recommendations or EUCAST as there is insufficient clinical evidence, but BSAC data is available and has been used to categorize susceptibility break points.